Populations of many North American songbirds are declining, and in many cases we don’t understand why—for example, whether the problem lies with reproductive success or in the survival rates of adults. Conservation efforts need this information to be effective, and bird banding stations can help fill in the gaps, providing insights into how demographics vary across space and time. A new study from The Condor: Ornithological Applications presents ten years of data from banding stations across northern California and southern Oregon and offers new hints on what’s driving changes in the region’s songbird populations. The Klamath Bird Observatory’s Sarah Rockwell and her colleagues used data collected at ten of the observatory’s bird banding sites between 2002 and 2013 to estimate the abundance and reproductive productivity of twelve songbird species, all either of regional conservation concern or indicators of coniferous or riparian habitat quality. 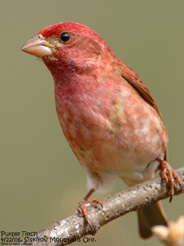 They found that three species (the Purple Finch, Yellow-rumped Warbler, and Dark-eyed Junco), all indicators of coniferous habitat, were declining across the region, while two (the Yellow-breasted Chat and Black-headed Grosbeak) were increasing, though the trends varied from site to site. While breeding productivity declined in three species, adult abundance was correlated with the previous year’s productivity for only one species, the Yellow Warbler, suggesting that local productivity is not the primary culprit behind population declines. About Klamath Bird Observatory: Klamath Bird Observatory advances bird and habitat conservation through science, education, and partnerships. We work in the Pacific Northwest and throughout the migratory ranges of the birds of our region. We developed our award-winning conservation model in the ruggedly beautiful and wildlife-rich Klamath-Siskiyou Bioregion of southern Oregon and northern California. Emphasizing high caliber science and the role of birds as indicators of the health of the land, we specialize in cost-effective bird monitoring and research projects that improve natural resource management. Also, recognizing that conservation occurs across many fronts, we nurture a conservation ethic in our communities through our outreach and educational programs. Visit Klamath Bird Observatory at www.KlamathBird.org. About the journal: The Condor: Ornithological Applications is a peer-reviewed, international journal of ornithology. It began in 1899 as the journal of the Cooper Ornithological Club, a group of ornithologists in California that became the Cooper Ornithological Society, which merged with the American Ornithologists’ Union in 2016 to become the American Ornithological Society. In 2016, The Condor had the number one impact factor among 24 ornithology journals, 2.654.